(CBS/AP) MASON, Ohio - It's the kind of story that makes even a Wednesday worthwhile. 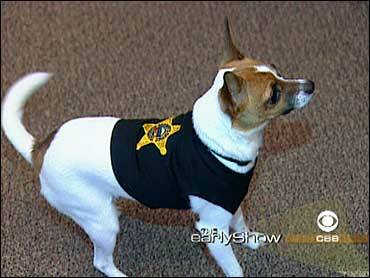 An Ohio man has been charged with a misdemeanor for barking at a police dog. It happened in the Cincinnati suburb of Mason - the police report says 25-year-old Ryan James Stephens is charged with teasing the K-9, which was in a patrol car. Officer Bradley Walker wrote that while he investigated a car crash at a pub early Sunday morning, he heard the police dog barking uncontrollably inside his car. Allegedly, Stephens - the "animal impersonator" - was making barking noises and hissing at the real thing. Walker reported that when he asked the barking Mr. Stephens why he was harassing the canine, he said "the dog started it." The officer also said Stephens appeared highly intoxicated (which is actually reassuring in this case). He's due in municipal court on April 21. No word whether he'll be in handcuffs...or on a leash.